For 50 days, Gaza’s Al Shifa hospital has lived to the rhythm of fighting followed by ceasefire followed by fighting again. On 25th August, an open-ended ceasefire came into force, bringing a massive sense of relief to MSF teams and to the population of Gaza as a whole. 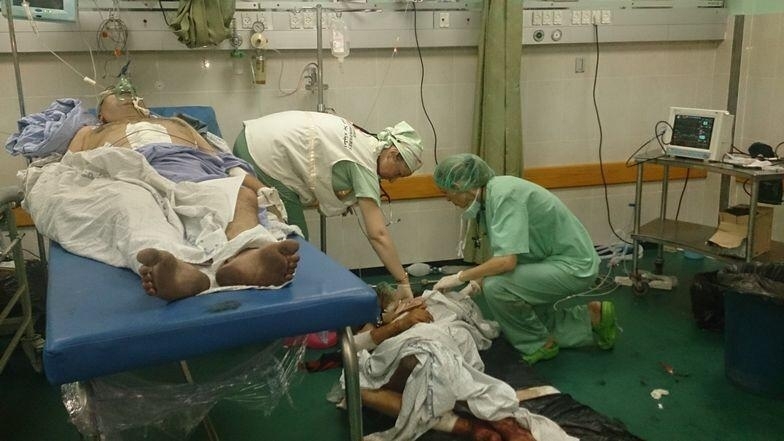 But activity in the largest hospital in Gaza continues unabated. Until the 25th of August, the hospital was still receiving people wounded in recent bombings, as well as people injured over previous days who were unable to come for treatment until now. MSF surgical teams continue to work shifts at Al Shifa hospital, alongside Palestinian Ministry of Health staff, as they have been doing since the Israeli army launched Operation Protective Edge on 8 July. As one MSF surgeon leaves, another one takes their place. Maurice, a thoracic surgeon, has just returned from Gaza. Two other MSF surgeons are currently working in Al Shifa hospital, operating on patients with severe burns who require multiple surgery, doing plastic surgery and carrying out skin grafts, amongst other things. They are also called on to assist with especially difficult or long operations. The 60-bed Al Shifa hospital receives patients from across the Gaza Strip, and includes six operating theatres, an intensive care unit where burns victims are cared for, and an emergency room. The Palestinian medical staff are very experienced, but a number of hospitals in Gaza have been destroyed or damaged, and the workload in Al Shifa is so heavy that they still need outside support. “People in the vicinity of an explosion are burned by the heat, while the blast destroys their lungs and shrapnel penetrates their body," says Kelly, an anaesthesiologist who spent almost four weeks in Gaza. "The shock wave can destroy the leg bones of a person who is standing, and both legs then need to be amputated – it's terrible, but there’s no other solution. " A young burns patient receives care at the MSF post-operative clinic in Gaza in February 2014. Since the recent conflict, a number of former patients have not been traced. Activities in the post-operative care clinic over the past seven weeks have been dependent on the intensity of the attacks. At the height of the war, the clinic closed for 11 days, as it was impossible for patients either to reach the clinic on their own or to be fetched by MSF car. During this time, the team provided dressing kits for patients. When the clinic reopened, 20 to 40 percent of patients were able to come for their appointments. A number of patients, however, have still not been traced. Now the clinic is full. "It's like a beehive,” says Dr. Abu Abed, MSF doctor. "As well as our former patients, we have been caring for new patients who were injured during the war. We saw more than 100 new patients between 1 July and 25 August. " The medical aid MSF is providing in Gaza takes a number of different forms. As well as working in Al Shifa hospital and the post-operative care clinic, MSF has also donated drugs and medical supplies to the central pharmacy in Gaza, to Al Shifa hospital, to Nasser hospital in Khan Younis and to Kamal Edwan hospital in Beit Lahiya. Perhaps most significant has been the successful collaboration between MSF teams and teams from the Palestinian Ministry of Health. With the blockade cutting off the entire population of Gaza from the outside world, in recent years Palestinian medical staff have been deprived of opportunities to share skills with international colleagues, to gain practical experience or to travel to medical conferences abroad. As a result, they have been appreciative of the chance to learn new surgical, anaesthetic and medical practices from MSF’s teams.